Morning Motivation — Are you being stubborn? Change is easy for some, not so easy for others. Either way, it is the one thing you can always count on. Everything always changes—feelings, emotions, the weather, appearance, age, the seasons, the stages of a project, your clothes. Everywhere, everything, everyone, including you are always constantly evolving. Is there something in your life you’re refusing to change even though it’s outdated or unhealthy or not working for you anymore? Don’t be stubborn, open up your mind and change it! Is it time to let go of that habit? Is it time to change your mind? Is it time to stop that practice? Is it time to end that fight? Is it time to give up that relationship? Is it time to give that new idea a try? Is it time to embrace a new solution? Is it time to say goodbye? Is it time to forgive? Is it time to start? Be determined but not stubborn. Recognize when it’s time to change. And create from change. Embrace change—it’s not going away. 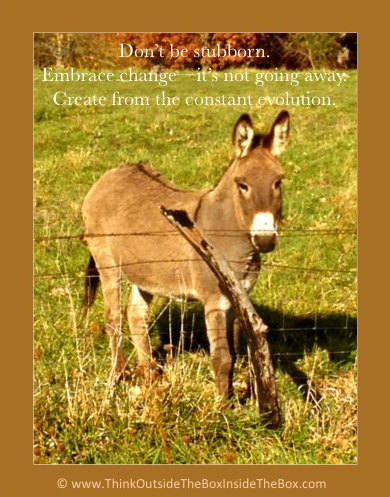 Create from the constant evolution of life.